Based on an original design by Hisui Sugiura, a famous designer at the time and Momosuke Fukuzawa's brother-in-law. When the building was renovated, these sofas were used in other rooms. Upon restoration of the house, the sofas were disassembled, restored using materials and techniques faithful to those of the time they were built, and put back in their original rooms. The wood frames and springs of the sofas are the original items reused. Information terminals introduce a range of attractions on the Cultural Path. 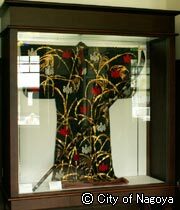 The only surviving examples of Kawakami's stage costumes and props she used on stage"Miyama-no-bijin". Contains photos of Kawakami in Paris, play scripts, magazine and newspaper clippings and a sketch of Kawakami by a young Pablo Picasso. 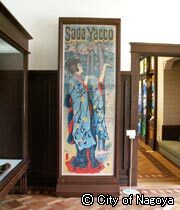 Sada Yakko (featuring guest star Sadayakko Kawakami), a poster drawn by German artist Mueller in 1900. Some of Kawakami's favorite items. The painting depicts the scene visible from the north of the Kawakami residence at the time it was originally built. The house is visible in the center. This huge panel was made of marble. 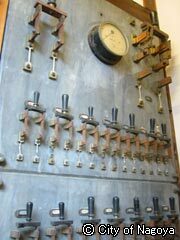 Bells were placed in all main rooms and the base unit was apparently located in the office. 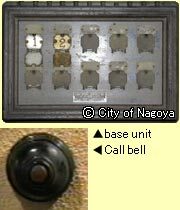 A press of a button would activate a bell and display a number to indicate which room's bell was being rung. 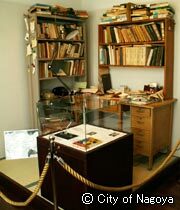 This is a reproduction of the study used by award-winning writer Saburo Shiroyama.